We're boldly moving forward in the fight against breast cancer. WE ARE MORE THAN PINK! One in six women in San Diego County will be diagnosed with breast cancer in her lifetime. While more women and men are living longer after a breast cancer diagnosis, there is still no cure. 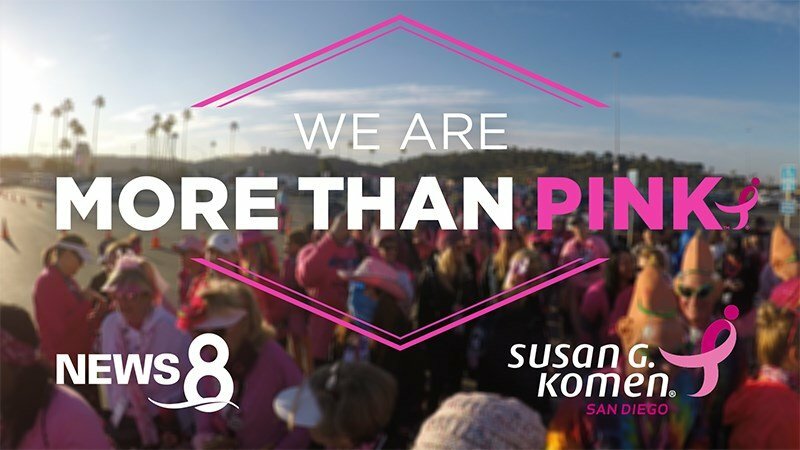 Join CBS 8 and Susan G. Komen San Diego in the fight against breast cancer. Take control of your breast health, learn the latest treatment advances and Komen provided services. Help generate funding for critical breast cancer research, treatment services and the cure. 9000 participants raised more than $800,000 and still counting! If you missed the race and want to join our commitment to end breast cancer, CLICK HERE to donate now. Please continue the journey November 15-17, 2019. BREAST CANCER CAN'T STOP YOU! Every major advance in the fight against breast cancer has been touched by Susan G. Komen research grants. Next to the U.S. government, Komen is the largest funder of breast cancer research in the world. Komen San Diego is our county’s largest funder of free breast cancer treatments, services and support for uninsured breast cancer patients and their families.